Gracey is one of Britain's leading lithographers. In 2017 she was elected to the society of Royal Painter-Printmakers. Gracey's work is a masterclass in lithography. A process through which everything is conceived in the reverse, Gracey seems to effortlessly transfer her ideas through this notoriously difficult medium. 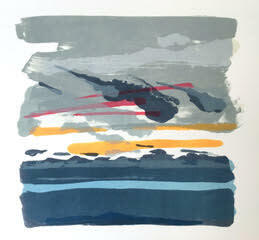 Gracey's lithograhs have a sense of freedom and playfulness which she controls exquisitely. Her work is based around the natural world and the exhibition South South-West will present Gracey's most recent body of work which is in response to the landscape of Cornwall. Cornwall has been the inspiration for artists throughout the 20th Century and Gracey brings a refreshing new take. Parallels can be drawn to the work of Wolf Kahn whose paintings of Vermont are similarly abstract in tone and instill an elemental response.